This patient initially chose Dr. Umar to repair the poor and odd looking growth from a previous strip surgery. Hair failed to grow in the crown area. And this created a rather isolated looking patch on the top part of his head. Furthermore, he also wanted to conceal his strip scar. Earlier in 2014, the patient decided to improve upon these results with a follow up procedure to create better density. 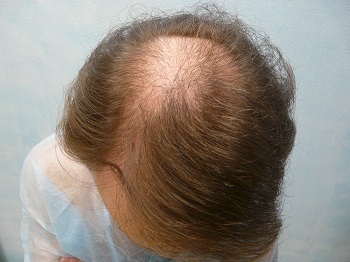 The photos shown below reflect the use of 1300 body hair grafts six months after this operation.